The Egyptian cabinet announced in a statement on Saturday evening that the joint Egyptian-Saudi technical maritime border drawing has determined that the islands of Tiran and Sanafir in the Red Sea fall within regional Saudi maritime waters, MENA reported. 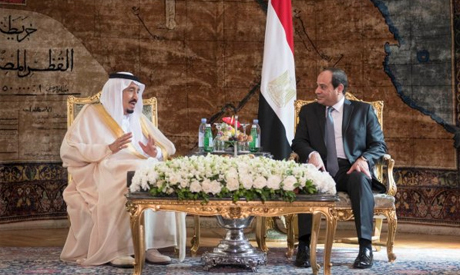 Egypt and Saudi Arabia have signed a number of political and economic agreements during the current visit to Cairo by King Salman Bin Abdel-Aziz, including a maritime border demarcation agreement. The cabinet statement said the agreement will be presented to the House of Representatives based on legal and constitutional considerations to be discussed and ratified. The Tiran and Sanafir islands lie at the south entrance of the Gulf of Aqaba in the north part of the Red Sea. The statement said that the determination that the two islands fall within Saudi regional waters is the culmination of a six-year process of studies and eleven rounds of negotiations between the two sides. The cabinet added that the maritime border agreement with Saudi Arabia allows Egypt to use shared Red Sea waters for excavation of natural resources, which would benefit the Egyptian economy. By giving up its land to its rich neighbor in exchange for aid, Egypt gave an example to other bankrupt nations such as Greece, which refused to sell its islands to get a bailout, of how easy it is to fins solutions to its economy, if it ever would.